MISSION: Special Olympics provides year-round sports training and athletic competition in a variety of Olympic-type sports for children and adults with intellectual disabilities, giving them continuing opportunities to develop physical fitness, demonstrate courage, experience joy and participate in sharing of gifts, skills and friendship with their families, other Special Olympics athlete and the community. From Special Olympics Nebraska’s beginnings over 40 years ago, we have grown from a few hundred athletes to over 5,000 athletes, providing year-round sports training, athletic competition and other related programs. Special Olympics Nebraska is active in over 110 communities statewide and can be found in hundreds of classrooms through our Project Unify and Young Athletes Program initiatives. 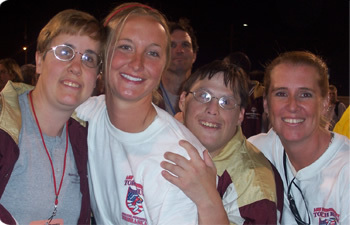 Special Olympics provides people with intellectual disabilities continuing opportunities to realize their potential, develop physical fitness, demonstrate courage, and experience joy and friendship. Sports opportunities are offered based on four geographic regions. Our athletes compete at the regional level striving for first, second or third place in order to advance to any state level competition. The Special Olympics Nebraska office is located at 9427 F Street, Omaha, NE.